1 To get rid of mould on walls with mould spray you may want to soak up some of our top tips! 1.3 Sometimes Trying to get rid of Mould on Walls with Mould Spray is Hopeless..
1.4 Tips and Tricks, so That you can get rid of Mould on Walls Without Spending a Penny. To get rid of mould on walls with mould spray you may want to soak up some of our top tips! The two that we have used the most, and can highly recommend come highly rated directly from Amazon. The ‘Astonish Mould & Mildew Remover’ and the ‘HG Mould Spray’. The latter is listed as an Amazon ‘Best Seller’. My view is that both work excellently. The real problem areas that these products are trying to target are surfaces like glass, tiles and the rubber sealant that is starting to rot around your bath. However it can be effective on walls. Be careful with how much you use at a time. These substances contain very strong bleach that give off strong odours. These will likely make you nauseous and even give you a headache alongside perhaps worse side effects. So be sure to clear the room! Just be sure to go careful as rubbing it on a painted surface is likely to ruin the paint work. Wallpaper – Successful, on a dark coloured wallpaper. Painted Wall – Unsuccessful, as you might imagine, the sprays would rub the paint away. If you’re feeling very brave and in your last resort (and you choose to ignore our advice), be sure to apply it in very small areas and begin with dabbing it on after spraying a cloth. The question “Does bleach remove mould?” has often seemed to be misconceived as a myth. The answer though, is yes. It does kill mould and in a similar fashion to the two mould sprays listed above. You can obviously expect it to be slightly less effective though as it’s lacking a couple of the crucial mould killing ingredients. When large quantities of mould are found, you need to first consider two things. How much is there, in terms of how easily are the spores from the mould likely to spread once you disrupt the concentrated area. Then consider if it is a job that is best left to a professional. 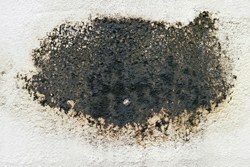 If you have discovered Stachybotrys mould, then you should not under any circumstances try removing this yourself. This will most certainly give off a deadly amount of toxins. One final thing to note. You should never be afraid to contact your landlord about the mould problems that persist in your home. It is a serious breach on your living conditions and should not be taken lightly. Be sure that they take the necessary measures to keep mould out of your home before the need to remove mould arrives. Sometimes Trying to get rid of Mould on Walls with Mould Spray is Hopeless.. If humidity levels in your home are too high, and you have a situation where condensation is constantly building up on your windows. Then it could be time to call in the experts for a more long term solution. Of course there are a number of excellent solutions right here on mouldremoving.com. One of our most highly reported solutions has been the Nuaire Drimaster PIV unit. And the cheaper, quicker to set-up alternative, the EcoAir DC12. But we want answers for what to do if the mould has already made it’s way on to your bedroom walls, and we want to get rid of it now. Tips and Tricks, so That you can get rid of Mould on Walls Without Spending a Penny. So we’ve already covered the regular household bleach option, that you can use and this can be very effective. Another item that you can use from finding laying around the house for your very own homemade mould spray is white distilled vinegar. Put this in to an empty bottle with a spray nozzle and you’re ready to go! Just spray on the surface and leave for an hour before wiping with a cloth. Bare in mind that these sprays may only kill mould on the surface. But catch it early enough and you may have seen the back of it. The next tip is more of a life tip. If you see some water streaming down the windows, or off of those pipes behind the toilet. Wipe it up. Every little helps when it comes to getting rid of mould, the trick is to stop it in it’s tracks by killing it early enough. We have now reviewed Astonish Mould & Mildew Remover.